Eleven Duluth sailing and rowing enthusiasts organized the Duluth Boat Club in July 1886. The next year membership had nearly tripled and the group built a clubhouse on Slip #1 in the Duluth Harbor, located between Sixth and Seventh Avenues West roughly where the stage of Bayfront Festival Park stands today. The facility stood three stories tall and was wrapped with verandas on its second and third stories; a square tower adorned one corner. By 1895 the Boat Club boasted 193 members who enjoyed access to a fleet of fifteen rowing shells and more than twenty pleasure boats. As the century turned, the club’s numbers swelled, and it soon required a larger facility. Knowing the recently approved aerial bridge over the ship canal would allow easy access to Minnesota Point, club officers chose to build their new complex, designed by John J. Wangenstein, on the bay side of the Point at Tenth Street and St. Louis Avenue. The Duluth Boat Club became Duluth’s social center, hosting regattas, water carnivals, and national competitions. By 1912 club membership had swelled to 1,400 members, making it the largest such organization in the United States. Membership had received a boost in 1907 when the Boat Club merged with the Duluth Yacht Club, whose clubhouse stood on the bay side of the Point at Fourteenth Street South. In 1909, club members moved the former Yacht Club facility to Fortieth Street South, the site of the Oatka Beach Pavilion that had burned earlier in the summer. They also operated a clubhouse on Spirit Lake from 1907 to 1917, the year club president Julius Barnes paid $75,000 for an indoor pool or “natatorium” at the main facility. Barnes hired James Ten Eyck to coach the club’s rowing squads. From 1911 to 1923, Duluth rowers dominated their competitors, taking home twenty national championships. The club’s “Invincible Four”—Max Rheinberger, Dave Horak, and brothers Doug and Phil Moore—did not suffer a loss between 1913 and 1916, taking home trophies from twenty-two national and international regattas. In 1922 Duluth Boat Club rower Walter Hoover became known as the world’s best rower after winning the prestigious Diamond Sculls competition on London’s River Thames. On his return to the United States, a flotilla of boats in New York Harbor saluted the Duluthian. In the Zenith City, 65,000 people turned out to greet the returning hero. Rowing’s popularity declined sharply in the 1920s, when many club members’ enthusiasm shifted to automobiles. By 1923 Ten Eyck had left; the club folded in 1926. 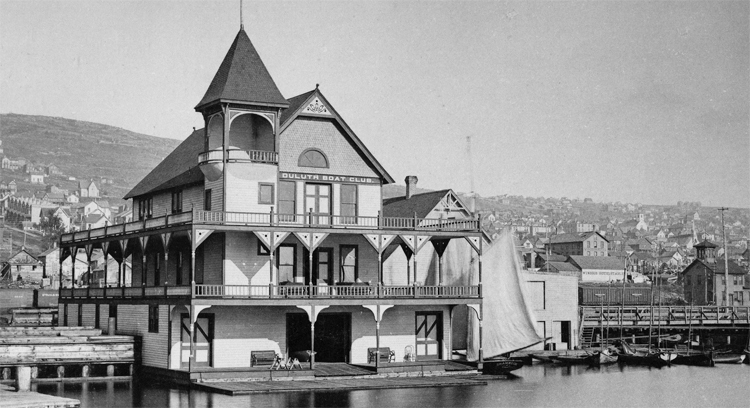 Barnes—then the president of the United States Chamber of Commerce—convinced the city to lease the club, and in 1931 the city handed the Boat Club over to the Park Department for management. To distance the facility from its reputation as a private club, and to provide a more accurate description, Park Superintendent Rodney Paine changed its name to the Duluth Water Sports Center. Activities included swimming, canoeing, archery, volleyball, horseshoes, picnics, card games, and dances twice a week. The sports center sparked a renewed interest in rowing, and the swimming pool was popular, but the facility was not financially successful. It closed in 1933. The boathouse was used to store boats until April 23, 1951, when an early morning fire destroyed the building along with sixteen vessels stored inside. The former Boat Club became the site of the Duluth Yacht Basin and later the Lakehead Boat Basin. The Park Point Marina Inn, which opened in May 2014, currently occupies a portion of the site. The Boat Club was revived in 1955 as the Duluth Rowing Club. In 1964 gale-force winds destroyed the 1907 Yacht Club/Oatka clubhouse facility. Today the Duluth Rowing Club’s boathouse stands in its place.